We have a new microcard reader in the library, for opaque microcards such as in the Travels in the Old South and Travels in the New South collections. It should be an improvement on the old one with its dodgy focus! It is still not possible to print from microcards however. 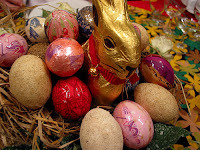 The library will be closed for Easter from Friday 21st – Monday 24th March inclusive. Our opening hours remain the same throughout the vacation otherwise. During the week of 25th-28th March there will be work going on in the garden (weather permitting) which may cause noise disruption in the library, particularly on the mezzanine. The desks on the north side (including the quiet area) will hopefully not be affected too badly. We now have new computers in the library for reader use. They have access to OLIS, the internet and all the usual electronic resources as before, but also have Microsoft Office (Word, Excel, Access) and EndNote installed. It is not possible to save anything to the hard drive however, so you will need to bring your own USB drive if you need to save things. If you don’t have a USB stick and need to save something temporarily (eg, to email it to yourself or to transfer to your own laptop), we have a couple that we can lend you – please ask at the staff desk. The only computer that hasn’t been replaced yet is the one attached to the microfilm scanner – this is due to a problem with incompatible hardware which should be fixed shortly. As readers of this blog will know, the VHL has been on LibraryThing since November, adding our new acquisitions each month. I don’t know how many of our readers are LibraryThing users (or Thingamabrarians, as I believe we are referred to) but I am a huge fan of LibraryThing. I have my personal book collection on there too (for which I either hang my head in shame or proudly proclaim my geekiness, depending on how you view such things), and I am loving the new developments they are constantly bringing out. The latest of these is LibraryThing Local, which basically adds listings of libraries, bookshops and literary festivals to LibraryThing, searchable by location. You can find the VHL here, and you can add us as a favourite library on your LibraryThing profile. Or even befriend us as a fellow Thingamabrarian! If you want to make use of the annotation, commenting, sharing and saving features, you can create a free account. The list of new books received in the library during February is now available on our website and LibraryThing page.